Valdeón cheese is produced with goat or cow milk, or a mixture of both. This Spanish cheese is matured in caves for a long time. Its flavor is quite strong with a high fat content, the mass is light yellow and with a soft texture. Valdeón cheese features make it a good Spanish cheese for spreads or to make sauces to accompany meat or mushrooms. 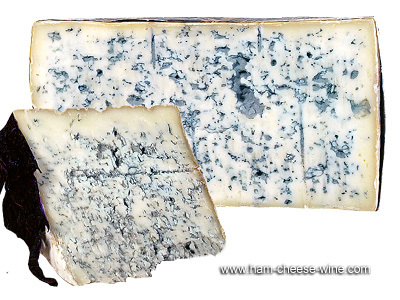 This Spanish cheese, as in most blue cheeses, is usually wrapped in aluminum paper, which allows for the conservation and maintenance of moisture levels. 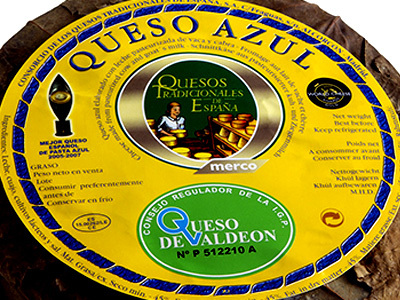 Valdeón cheese is a blue, oily mass cheese. The bark of the whole cheese is natural, thin, soft, and yellowish with gray tones. The mass is ivory white, bright with a faintly marked aura according to the degree of maturation. When we make a cut to this wonderful Spanish cheese, many greenish blue, evenly distributed cavities of irregular shape and variable size can be seen. 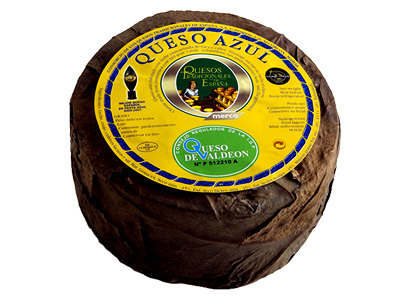 Valdeón cheese has an intense, salty and spicy, slightly burning flavor. Valdeón cheese is made only with milk produced by cattle from Valdeón valley, which feeds on the rich green pastures of the place. The bluish color of the mass of this Spanish cheese with holes and hollows where the characteristic mold grows, make it a distinct and easily recognizable product. These Spanish cheeses are cylindrical in shape with flat faces and rough whitish bark. The cheeses are covered with plágamo leaves. It is also presented in jars of cheese cream.